Now I am two days late with my writing assignment for this week. But for a very good cause today (yesterday was due to work) - me! Me on the water! 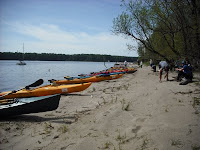 Many members of my dragon boat team, plus a few other women, went up to Ridgefield, WA, today for an intro kayak lesson, followed by a five-mile round trip paddle on the Columbia river. It was a beautiful day; slightly overcast, warm, minimal wind, dry. The water was perfect. There were a few more power boats than I would have liked, but only one or two were jerks about it. (One, I swear it was deliberately causing big wakes for us, such as the ones in the video while we were on shore.) But all of the paddlers were fabulous; the guides were excellent and very helpful and supportive; the guys that helped get us fitted and into the boats were great. We saw a bald eagle sitting at the top of a tree. A blue heron took flight right in front and over us. Beautiful! Wonderful day. Below is one short clip from when we were taking our break before heading back. There were actually 18 of us, plus another four guides - so not all of the boats are in the picture. I will get my story done. I will! TADA : The demise of balloons.